Abbey Mill at Abbey Mill Wye Valley Centre01291 689228work ShopAward winning Abbey Mill is a well-established independent family business and has been trading in Tintern village for the past 60 years. Set amidst breathtaking scenery and situated on the banks of the River Wye in the original mill site of Tintern Abbey, founded in 1131, Abbey Mill offers a relaxed setting for your enjoyment. Abbey Mill has adapted to the needs and demands of the area over the centuries. Formerly a corn mill and later probably a woollen mill until Abbey and monastic life were suppressed in 1536. From 1570 mill activites turned to iron-wire works until the early 1800s. Records from 1820 probably reverts the mill back to corn and, at some point, it changed again to a wood turnery, saw mill and builders' store until the mid 1970s. Today Abbey Mill still stands proud for people to enjoy after surviving more than 860 years. Come and see the waterfall, watch the trout and shop and browse through the 5 distinctively different shops housed in the "Old Mill Buildings". Admire the skill and patience of members of the Wye Valley Craft Association demonstrating their individual crafts for you. Then take a rest from it all in our friendly licensed Coffee Shop and Restaurant (available for private functions) that is renowned in the area for both quality and value. Award winning Abbey Mill is a well-established independent family business and has been trading in Tintern village for the past 60 years. Set amidst breathtaking scenery and situated on the banks of the River Wye in the original mill site of Tintern Abbey, founded in 1131, Abbey Mill offers a relaxed setting for your enjoyment. 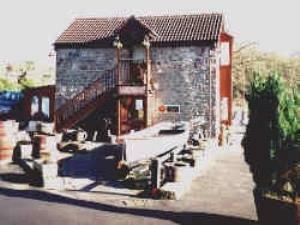 The Angiddy Room - Home to the Wye Valley Craft Association offering their own unique and individual Crafts. Abbey Mill is located in the centre of Tintern on the A466 and is easily accessible from the M4, M48, M5 and M50 motorways. Tintern is only 6 miles from junction 2 of the M48.